Presenting 100% compostable side plates that are food-safe, disposable, unbleached, attractive, sturdy, freezer safe, diabetic-friendly and microwave safe. Presenting truly earth-friendly, 100% compostable, 100% microwave safe 6-inch portion control Side Plates. 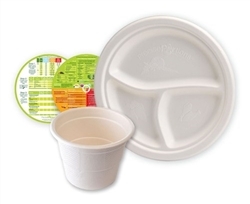 Our compostable side plates are truly food-safe, disposable, unbleached, attractive, sturdy, freezer safe, diabetic-friendly, easy to store, microwaveable and 100% environmentally friendly. Arranging an outdoor or even a small patio party is not a joke especially for diabetics. The food has to be cooked (or at least warmed) prior to serving, and then thereÕs either the after-party washing up or bagging all the disposable side plates. Landfill sites are full of so called disposable cutlery that doesnÕt biodegrade Ð these just lie beneath the soil leaking dangerous chemicals for years to come. 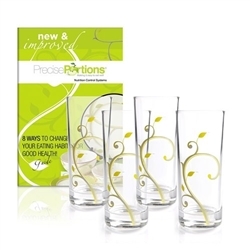 The Precise Portion 6-inch Side Plates (patent pending) are made from earth-friendly recyclable natural fiber that does not react with food. Made from natural fiber, our Side Plates are 100% compostable, also fully microwave safe, and freezer safe. You can warm or even fully microwave the food on our 6-inch Side Plates. Serve directly without the need for additional pots and pans. Unlike flimsy plastic or paper plates, our 6Ó Side Plates are very sturdy and wonÕt buckle when food is placed on it. There is absolutely no danger of dropping food on your expensive shoes or clothes. 100% microwaveable and 100% compostable also makes our Side Plates very convenient and environmentally friendly. For diabetics, controlling the amount of food they eat is the only way they can control the glucose and carbohydrate intake. A 6-inch portion control side plate is just the right size for tighter food control. Being small, the side plate will fill almost immediately making it impossible to overeat Ð no matter how delicious the food. So unless your family members or guests deliberately go for refills, for diabetics, it would be easy to calculate the glucose and carbohydrate intake and therefore, the insulin requirement. 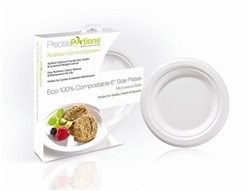 So go ahead and grab a pack of our 100% compostable, 100% microwave safe 6-inch portion control Side Plates. 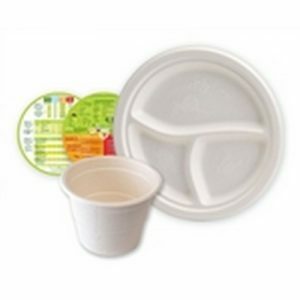 Use these disposable side plates during any outdoor party and you can even keep a pack at your office. Prove to your family, guests and friends that you not only care about their health, you also care about the environment. 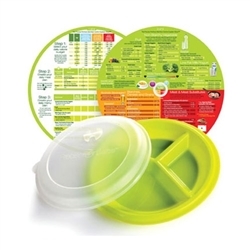 Each box is attractively packaged and contains 25, 6-inch, disposable, fully microwaveable, 100% biodegradable portion control Side Plates.